7+1/2" to 8" long. 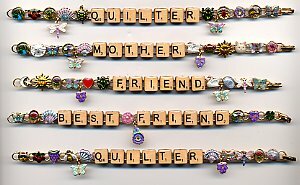 We make these bracelets with any name that will fit, so if you want something different please specify in "additional information", when you order. Button Bracelet with large buttons. Approx. 7+1/2" long with 11 links, and 8+1/4" with 12 links. Select the number of links. Each bracelet we do is a one-of-a-kind original so there are no specific choices to be made, but all bracelets will be similar to those shown above. Button Bracelet with small buttons. Approx. 7+1/2" long with 16 links, 8" long with 17 links. Select the number of links. Each bracelet we do is a one-of-a-kind original so there are no specific choices to be made, but all bracelets will be similar to those shown above. Button Bracelet with small buttons. Gold and Black color theme. Approx. 7+1/2"" long with 16 links and 8" long with 17 links. Select the number of links. Each bracelet we do is a one-of-a-kind original so there are no specific choices to be made, but all bracelets will be similar to those shown above. Button Bracelet with larger glass buttons. Approx. 7+1/2" long with 5 links. 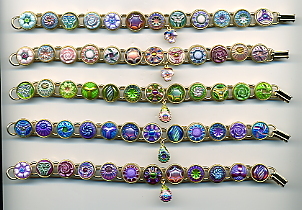 Each bracelet we do is a one-of-a-kind original so there are no specific choices to be made, but all bracelets will be similar to those shown above. Button Bracelet with small glass buttons. Approx. 7+1/2" long with 12 links. Each bracelet we do is a one-of-a-kind original so there are no specific choices to be made, but you can request the basic color scheme. Button Bracelet with glass buttons on silver links. Approx. 7+1/2" long with 7 links, and 8+1/4" with 8 links. Specify number of links. 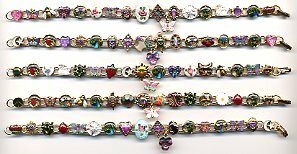 Each bracelet we do is a one-of-a-kind original so there are no specific choices to be made, but all bracelets will be similar to those shown above. Button Bracelet with glass buttons on gold links. Approx. 7+1/2" long with 7 links, and 8+1/4" with 8 links. Specify number of links. 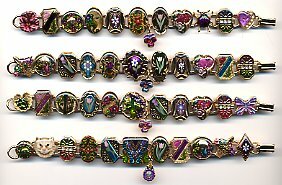 Each bracelet we do is a one-of-a-kind original so there are no specific choices to be made, but all bracelets will be similar to those shown above. These bracelets have " Glass Domes" over the images, rather than the acrylic used on the larger buttons, so they will be much more durable. Each dome is approx. 3/4" in diameter. The images will be assorted from our VIP Paperweight buttons. Approx. length is 6 & 1/2". They can be made larger for an additional charge.